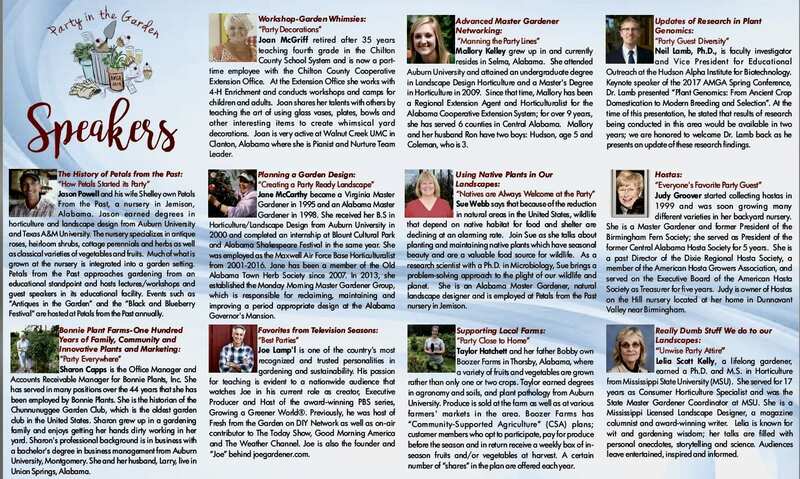 Chilton County Master Gardener Association, along with Autauga and Shelby County MG Associations, has the honor of hosting the 2019 Alabama Master Gardener Association Conference. The Conference is being held at Clanton Performing Arts Center in Clanton, AL on May 8,9, and 10. The public is welcome and registration is now open. There is a great lineup of speakers and activities! One of our most noted speakers is Joe Lamp’l, Executive Producer and Host of the PBS series “Growing a Greener World”, previous host of DIY’s “Fresh from the Garden”, and on-air contributor to The Today Show, Good Morning America, and the Weather Channel. And he is just one of the great speakers! Online registration is at www.alabamamg.org. Just click on 2019 Annual State Conference(in red), then click on Registration (in green) to be taken to online registration. We hope to see you at the AMGA 2019 Conference!